When you book your rafting trip online with 12 or more adult rafters you will automatically receive a group discount for everyone in your group. For a group of 24 or more would receive a discount of 15%. The bigger your group, the bigger your group discount. For special pricing options for large groups contact EarthTrek Expeditions at 800-229-8735 or fill out our request a quote form. We will assign your group a discount code so everyone in your group can pay individually online and receive the group discount. Please Note: Our youth rates are already discounted and we cannot offer group discounts off these rates. 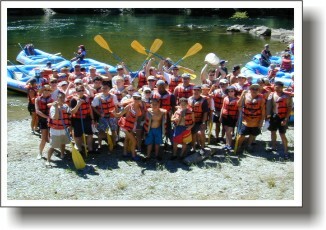 In many cases our group discount for groups will be lower than our youth rate so we suggest that you book kids (7-15 years old on the South Fork) as adults to receive the best rate. When doing so please list the names and ages of all kids on our online reservation form. Youth Groups: Boy Scouts, Girl Scouts, YMCA and other youth organizations qualify for a special discounted rate. Contact EarthTrek for rates and available dates.